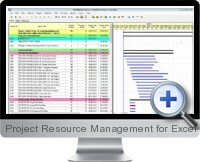 Excel Project Resource Management (PlanExc Pro) is an add-in for Excel 2007 and higher to provide tools for project planning, active scheduling, monitoring and resource management. Project resources are managed by defining up to 1200 activities with categorization and scheduling that have resources allocated and distributed between them. Resource distributions can be visualized with charting and summarized financials for each activity and category. Defined holiday dates are accounted for in scheduling and resource allocation. Project resources can be distributed to activities separately from the scheduling. Resources can be assigned at any activity level to manage a fixed quantity or required quantity of resources. Defined resource quantities can be allocated based on specified distribution curves. Monitor scheduled activities with current versus planned chart analysis. Activity progress reporting monitors the status of the project. Define and apply various types of resource loading to project activity. Visualize project and resource reporting via histograms and S.
Financial reporting summarizes cash flow and budgeting information. Schematic animation displays how scheduled activities and resources will progress over a specified time frame. I thought it is well structured.